macOS SierraとiOS 10の新機能「Universal Clipboard」はP2Pでデータを同期し、Mac間などでも利用可能。 | AAPL Ch. John Gruber:I’m gonna say Universal Clipboard, because I’ve always wanted this. 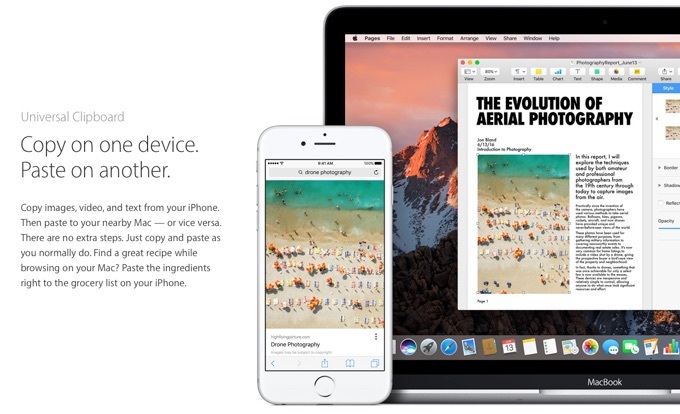 Craig Federighi:Well and even the communication is, like the other continuity features, peer-to-peer. So it’s not like you’re sending everything you copy up the cloud all of a sudden just so it can get down to the other device. The first is the “universal clipboard,” which will let you copy text on your phone or tablet and paste it on your Mac or vice versa. It also works between iDevices and between Macs, so you can paste stuff that you copied on your laptop, too.